I don't remember ever thinking that I'd grow up to be one of those guys telling stories about the “old days” of fishing. But here I am, getting ready to tell a story about one of the differences between “the old days” and the really good, “new days”! It's easy for me to remember my first fishing flasher because I had to build it myself. Yes, that's right, I built it myself. You see in the “old days”, when the “Green Box” first came out, It was high on my priority list, just not in my budget. My step father had a way of coming up with an odd twist on every idea though and he schemed up a good one this time. There was an electronics store called Heathkit, and if you had a little aptitude for electronics, you could buy these projects. Do it yourself versions of cool stuff, but at half the price. So there ya go, we'll just pick up one of these little beauties, Jeff can slap it together and we'll be ready for action. So for me, that's where it started; Almost at the beginning of time, at least in terms of fishing electronics. One flasher led to another, each one a little better than the one before. Then came the paper graph, then the LCD, then the Loran C, the GPS and so on. Each step along the way, I would eventually move to the new technology, sometimes kicking and screaming, but always making the move eventually. For the first time, I left my flasher at home. Oh don't worry, I didn't go fishing blind, I just had a better mouse trap. This time I took along the Humminbird 788. Now, I have everything I need in one gadget. Take me to the spot, tell me where I am and let me see the fish. I've loved my flashers, each and every one and there are even a couple of them that I'll hang on to. But these days, it just makes too much sense to be using a unit that can do more. Why should I carry a GPS and a separate flasher? Why not take two units, put 'em one box, connect a battery and go? Maybe it's because I need the cheaters these days to see the small screens on a hand held GPS units. But I really do like the luxury of seeing a larger, brighter chart screen. Besides esier viewing, there's more information on the screen now, so I can make my way to the spots even faster. For me, you just can't beat navigating on the ice when you're using the Lakemaster Charts in a full screen unit like the 788. You can see every detail as you move from spot to spot and it saves a bunch of hole drilling. All you need to do is head to the spot and punch a couple of holes right where you want them. Now, just press one button, drop in the transducer and start fishing. You're using the same unit so there's no down time. How easy is that? Too easy not to at least try it. It's as close to fishing from a boat as you can get. Over the years, we've been trained that flashers are for ice and graphs are for water. But most of the reasoning behind that philosophy is obsolete. I know, you're gonna say something like; “But I can see the fish better on my flasher”. I know, you may think you can, but I'll bet not. 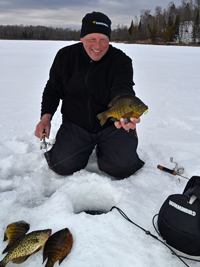 We fish during the open water season, using our combo units for spotting all kinds of fish. While we watch for fish, we've got our eyes on the Lakemaster Charts keeping track of where are and where we're going. We don't have any problem spotting fish, staying on top of them or catching them. You can see your bait, the fish, the structure, everything. It's great! Guess what? It works just as well in the winter too. It really started in 2010 when I fiddled around with Humminbird's 385 combo. A nice, compact package with a screen that's bright and easy to read. The 385 made it a lot easier for me to travel from spot to spot, but when I'd arrive at a new location, I was still switching over to the flasher for fishing. Somewhere along the line, I got smart and just started dropping in the transducer that was connected to the 385 instead. It was great, a real time saver, just push a button and switch between the GPS and Sonar Screens. In fact it was so nice that I started asking questions, what if I could do that with my other units too? Yes, you can, all the way through the line of 700 Series units including the one I used, Humminbird's 788ci HD Combo. It's rigged up just like you'd rig any other portable ice unit. All you need is a battery, a box and an ice-ducer. The GPS receiver is built in, so there's no extra wires, no extra connections. Just the power cord and the ice-ducer, just like your flasher. If you're really addicted to watching the dial on your old flasher, there's a screen view that lets you do that. But just like watching fish on the sonar screen during open water, the standard sonar settings show me all the detail I'll ever need to help me catch a lot of fish. As an added bonus for me, the 788 is compatable with the larger unit I have mounted in the boat. So, if I ever need it, I've got a backup ready to go on a moments notice. For you, it could be the way to update your baot and have a great ice unit all at the same time. Be your own judge, but if you give it a try, I'll bet that you wind up agreeing with me, it's a better mouse trap! "Combining the GPS and Sonar into a single unit helps get me to the spot in a hurry and helps me find fish faster. That leaves more time to put fish on the ice".